The city shines brightest at night, and so does Jake Gyllenhaal in this chilling, suspense-filled drama, Nightcrawler. Nightcrawling is the act of a freelance journalist following crimes through police scanner radios, filming the footage, and selling their work to news outlets. It is a dangerous and competitive field that can result in disastrous outcomes. Lou Bloom (Gyllenhaal) is just trying to find his way in life. A loner, Lou looks for odd jobs and any way possible to make a dime. While driving home from a failed, impromptu self-selling session, he notices a fiery crash on the highway and an aggressive duo filming the action. After a brief interaction with soon-to-be rival Joe Loder (Bill Paxton), Lou discovers a new passion. He purchases a cheap camera and rides around in his beat up car, attempting to formulate a career in nightcrawling. He studies police codes and does his homework on the streets of Los Angeles. As he begins to find some success by selling to KWLA, headed by Nina Formina (Rene Russo), Lou enlists the help of timid, yet lovable Rick (Riz Ahmed) to help him navigate and get the juicy stories. Flying through the streets in his newly purchased red Dodge Charger loaded with the best gear possible, Lou becomes the main player in the L.A. scene. As the competition between Loder grows and his lust for Nina matures, he finds himself pushing ethical borders in order to find success, and validation. The pivotal point in the film takes place when Lou arrives to a wealthy homeowner's place and is the witness of a triple homicide. As he watches the criminals disappear off into the night, he sneaks into the home and gets footage that videographers dread in their dreams, but love for their profession. Holding on to key pieces of evidence, Lou is hounded by the police for the real details of the murder, but Lou has other things in mind and will stop at nothing to get his perfect shot. "I'd like to think if you're seeing me you're having the worst day of your life." No Lou, I'm having a great day. I was absolutely blown away by this film when I saw it in theaters last year. I purchased the DVD the first day it came out, which I never do and I've watched it twice on Netflix. So far. Written and directed by Dan Gilroy, Nightcrawler is a wonderfully written film, beautifully shot and a film that is completely like any other. The fact that it is an original film based off of a underground, for a lack of a better term, profession makes it stand out above the rest and I believe it deserved more awards than it received. However, I may be biased being a college graduate with a communication degree. As a quick note, the soundtrack in this film is ominous and sets the tone for the film. Dreary, with a hint of devilish intentions. It won't be one that you play in your CD player, but one that sets the mood and atmosphere for the excellent film. 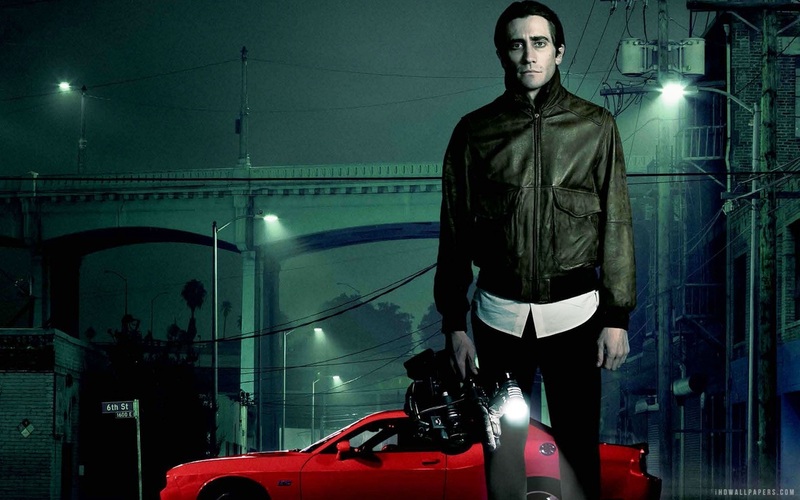 Nightcrawler is a unique, tense, and fast-paced thriller that left me at the edge of my seat from the word "go." Jake Gyllenhaal delivers, in my opinion, his best performance ever, slightly edging out cult favorite Donnie Darko. Lou Bloom is creepy, eerie, terrifying, yet funny. His lack of social skills and combined with his mild-mannered demeanor is upsetting and creates an uneasy viewing experience. His lone outburst in the film is a pure jump scare and sticks with you long after viewing the film. Russo and Paxton play their parts perfectly and create interesting characters for Lou to interact with almost on a daily basis. The competition between Bloom and Loder is exceptionally well done and the relationship between Nina and Lou is intriguing, testing her integrity and self-esteem. Bloom has a control over her that frustrates, yet excites her, both personally and professionally, respectively. Riz Ahmed creates room for you breathe in this film with his comedic timing and ability to add vulnerability to the film. Playing directly off of Lou's intensity, Rick's laid back attitude develops an interesting dichotomy throughout the movie and is a great on-screen duo. Lastly, the city of Los Angeles has so much history, both in crime and crime depicted in film. Were this filmed in New York or Chicago or any other city, it would not have had that same neo-noir feel to it. There's just something about L.A.'s seedy, historical crime past that makes these movies feel even more dirty, grimy, and realistic. One of the, if not, the best film I've seen in recent memory. All personal biases aside and judging this strictly as a fan of film, Nightcrawler is a true classic that should not even see the light of day in your Netflix queue, because you should watch it instantly. And then again.